What started out as an improbable goal is almost now a reality. 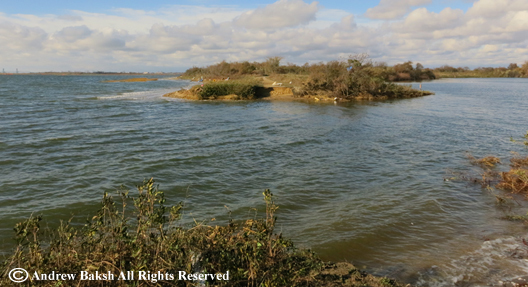 Finally, after 4 years and a few months, the breach on the West Pond at Jamaica Bay Wildlife Refuge, in NYC is closed. The shoring up of the breach continues and the loop trail is inaccessible to the public but the most difficult stage of the project in closing the breach is finished. The next step is the restoration of the pond to being a fresh water source. 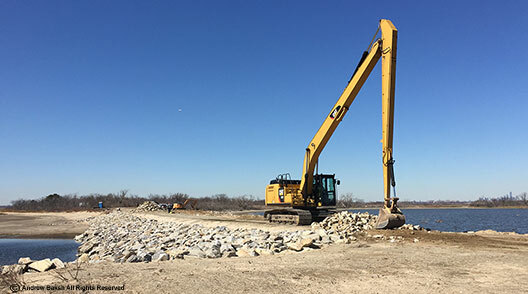 The West Pond breach closure and restoration was a hard fought quest that required patience, doggedness and skills in negotiating the many obstacles that were encountered along the way. There were many people who felt it was a waste of time and money and were all for leaving the breach as it was and letting the pond go to "waste". To quote one naturalist who, I won't name, "let it go back to what it was." Well we did (tongue firmly planted in cheek). I won't however dwell on the negatives and instead focus on the positives while thanking some of the people and organizations who deserve a shout out. In 2012, when the breach occurred (see my 2012 report here) and the subsequent inaction set off alarm bells on whether the West Pond was lost forever. A few individuals began brainstorming on what to do. Doug Futuyma, Professor of Evolutionary at Stony Brook University and I began to discuss what were our options. Who could we get to back a West Pond restoration. We turned to New York City Audubon (NYCA) and thus began the discussions on a larger scale on what actions could be taken to get a restoration effort on track. Harry Mass, then president of the Board of Directors of NYCA, was very instrumental in securing the backing of the organization. He arranged for us to use their office at 71 West 23rd Street in NYC, where we began holding meetings and eventually formed the group "Birders Coalition for Gateway." The group included many like minded organizations, individuals and birding groups from NYC, Long Island, Queens and Brooklyn. In any discussions, you want to negotiate from strength and we needed to show that the West Pond was utilized by many but how? 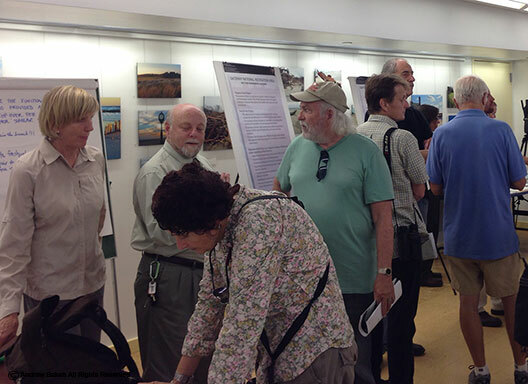 The online petition to restore the West Pond that resulted in over 7,500 signatures with personal comments from people who had visited Jamaica Bay Wildlife Refuge (JBWR) was a huge impact in getting that message across. That petition had its detractors and sadly did not enjoy the support and championing to promote its objective by many "key" individuals. Luckily, the few that did, made an impact. 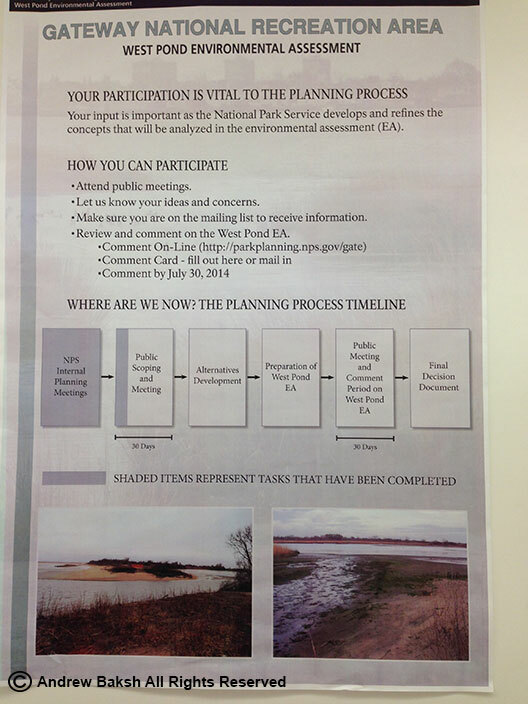 It was this piece of document that got a lot of attention by the right people. This I heard directly from sources within Gateway National Recreation (folks do pay attention to numbers). My thanks to all of you who took time out to sign and submit your personal account of what the West Pond meant to you. I also want to thank those of you who championed the petition and worked hard at getting signatures. One person in particular, Anne Lazarus, who along with some of her friends called and petitioned people wherever they went in an effort to get signatures. Thank you to all of you. This project would not be where it is today without the hard work of the members of "The Birders Coalition for Gateway" some of whom I worked directly with like - Doug Futuyma, Harry Mass, Susan Elbin, Seth Asubel and Jennifer Nersesian are just some. We would not be here without the support of Gateway National Recreation Area Management. They took a lot of heat and blame for allowing the breach to widen post Hurricane Sandy but when it mattered in getting the breach closed, management, led by Jennifer Nersesian and her able staff, like Patricia Rafferty came through. We would not be here without the backing of organizations like the Linnean Society of NYC, Brooklyn Bird Club, Queens County Bird Club, New York State Ornithological Association, Protectors of Pine Oak Woods, Jamaica Bay Ecowatchers, American Littoral Society - North East Chapter, Great South Bay Audubon Society, Huntington-Oyster Bay Audubon Society, South Shore Audubon Society, American Birding Association and others who all supported the efforts. We were lucky to get support from unlikely quarters in Senator Chuck Schumer who went on record to support the restoration and Canadian poet, novelist, literary critic, essayist and environmental activist Margaret Atwood, who used her presence on Twitter to tweet out her support. Last but not least, a heartfelt thanks to all of you who in some form or another lent your support to a West Pond restoration. We would not have gotten anywhere without all of your activism in supporting a restoration. Your efforts in participating in the Jamaica Bay General Management plan all sent a clear message to the management of GNRA, that we are committed to preserving our wildlife and the habitats they use! If you ever need my support for any of your projects, please feel free to seek me out. I hope someday soon I might run into any of you at Jamaica Bay Wildlife Refuge where together we might enjoy marveling at the wildlife that once again occupy the West Pond. 7 American Oystercatchers were observed at Breezy Point in Queens NYC on 3-11. Of the 7, three were banded. After getting a read on the codes, I realized that I had documented all three at the site in previous seasons. The bands read as follows: U2, YAE and YAJ. Hopefully these birds will settle in and use Breezy Point as their breeding site. Breezy Point in Queens is a critical stopover and breeding site for many birds including, American Oystercatchers, Piping Plovers, Common, Forsters, Least and possibly Roseate Terns. Please respect the roped off areas at Breezy Point and do not disturb nesting birds.